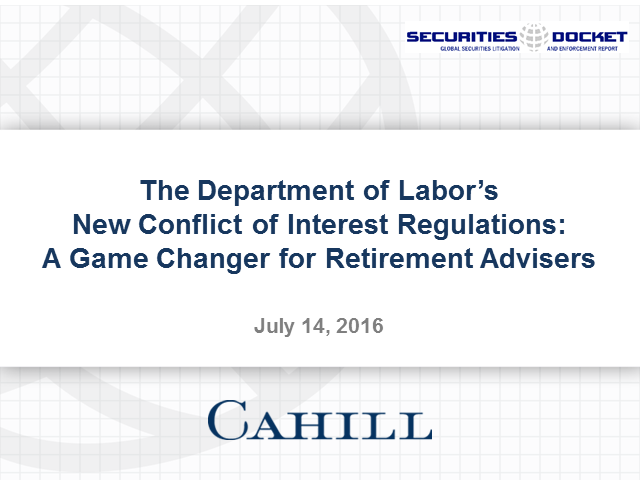 In April 2016, the Department of Labor issued final regulations expanding the definition of “fiduciary” for advisers to retirement plans, including advisers to IRAs and ERISA plans. Some advisers and financial institutions who previously were not considered fiduciaries now will be required to meet a fiduciary standard of care and, unless an exemption applies, may not engage in so-called “prohibited transactions” that create potential conflicts of interest (e.g., receiving compensation from third parties in connection with a transaction involving an IRA or an ERISA plan). In this Webcast, Brad Bondi (a partner at Cahill Gordon & Reindel LLP who leads the securities enforcement and regulatory practices) and Michael Wheatley (an associate at Cahill) will address issues concerning the new regulations, its impact on the financial services industry, best practices for financial services firms and lawyers to prepare for this new regulatory scheme, and pitfalls to avoid.